Usually I like to do my reviews in chronological order, but I feel compelled to write this one as soon as possible because this bus route is hell spawn and I’m worried it’ll do something awful to me if I don’t kill it ASAP. 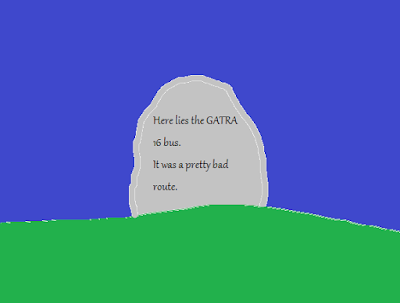 Ahem…the GATRA 16, everyone. Time for some context. My first encounter with the 16. Well, it turned out that wouldn’t be for a while. I tried to incorporate it into so many itineraries, but the stupid schedule made it impossible to time with anything. I’m sorry, but I wasn’t about to wait for hours on end in South Attleboro just to ride a stupid GATRA route. Also, seriously, how the heck did that garbage station get a 5??? ATTEMPT #2: Okay, so finally, over a year later, I was able to incorporate the 16 into an itinerary. Sam and I were planning on doing a 16 to South Attleboro after our 14 ride. Great. But…it just wouldn’t come. We were waiting there and it just wouldn’t come. And as the time ticked by, we knew we would miss our train home if we missed it, and we knew that meant waiting for three hours in South Attleboro. It just couldn’t happen. It arrived almost 20 minutes late, but we had to ignore it and just hop on the train home. ATTEMPT #3: It was clear by this point that the route had an on-time performance issue, so it needed to be handled with care. Nathan and I decided to take another stab at it as part of an after-school itinerary down on the Providence Line. We were going to get the 3:55 train from South Station, which we had plenty of time to get to from the end of school. Oh wait…there was a mandatory rehearsal for marching band that day until 4. “We’re definitely going to end early,” our band teacher assured us a few days before. Okay, that was promising. As long as the rehearsal ended around 3:50, we could still make the 4:30 train and get the 16 done. We could still do this. But the rehearsal didn’t end early. It went right up until 4. But…Nathan and I were still optimistic. After all, we had made a 2:55 train to Worcester after leaving the school at 2:30, so tight Commuter Rail connections were possible. We rushed out of the gym and tried to open the door downstairs…but it was locked. “What the heck?” the percussion teacher exclaimed, fumbling through his enormous collection of keys while the bass drum players decided it was a great time to play as loudly and annoyingly as possible. Finally, a custodian came and unlocked the door for us, and Nathan and I burst through the door ahead of everyone else. I had to crouch-run so my sousaphone wouldn’t hit the ceiling and explode, but we eventually made it downstairs to the band room door…which…was…locked. “Go through the chorus room!” Nathan said, remembering the secret hallway. We scurried through the maze of doors, popping out into the band room, and we scrambled to put our stuff away as quickly as possible. By the time we were done, everyone else had made it in, and they were standing around near the exit. We pushed through them and sprinted down the hallway, coming out and heading towards Harvard. We had considered doing a 68 that would arrive a little before 4, but clearly that wasn’t happening, so Red Line it was. We got down to the platform just as a train was closing its doors. Darn it! But the next one was in three minutes, which was a good distance – it was soon, but it was far enough behind the previous train that it wouldn’t be too slow. The train came, we got on, and we were off. The Red Line likes to dwell. A lot. It was clear by the time we got to Kendall and we were just sitting there that we weren’t going to make the train from South Station. But maybe we could make it from Back Bay or Ruggles? “There’s an Orange Line train that times perfectly,” Nathan said, looking at the MBTA live map. So, at Downtown Crossing, we pushed through the crowd, did the transfer of death, and…just barely missed the train. There was another one in three minutes, though! We hopped on, and it actually moved at a decent clip. Plus, the Providence train was running a minute late, which wasn’t much, but it was something. We stayed on through Back Bay because the Commuter Rail and the Orange Line were scheduled to take the same amount of time to Ruggles, and we would be able to see the train in the Southwest Corridor en route. As our subway car arrived at Ruggles, we could just barely see the Commuter Rail train stopped there. We sprinted out, well-knowing we would miss it, and…yep, there it goes. Had any one of the things that went wrong not gone wrong, we would’ve been fine!!!! But there was still a chance with the 4:53 train. It would arrive at South Attleboro at 5:57, while the bus leaves it at 5:59. It was a long shot, but the 16 is often late, so it seemed plausible that it would work. The train made it down to South Attleboro in good time, and we got out and started looking around. OH MY GOD IT EXISTS!!!!! THERE IT WAS!!! It was coming down that access road that runs parallel to the Commuter Rail tracks right next to the station! Now, as anyone who has ever seen a GATRA bus knows, you can “Give us a wave!” at any point on any route to get the bus to stop. 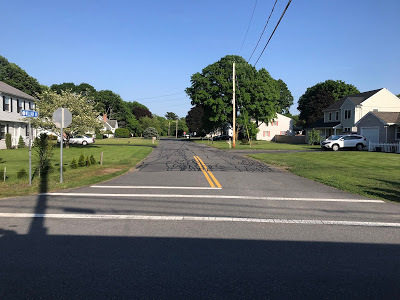 Given that this was a local road with slow-moving traffic and a sidewalk, it seemed perfectly reasonable to wave for the bus here. And so wave we did. The driver had a look of fury in his eyes. 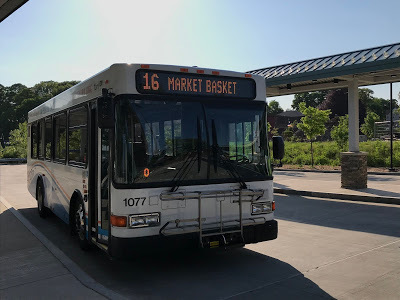 As the bus slowly moved past us, he motioned a huge “NO” with his arms and jutted his thumb back towards the Market Basket. Wait…but…but…but nothing. The bus drove straight by. As far as I could tell, we were waiting in a perfectly safe spot that presented no reason that a “wave” couldn’t be given. I have no idea how I prevented myself from yelling at the driver from the sidewalk. Actually, I have no idea how I’m currently preventing myself from writing in all-caps right now, considering how angrily I’m pounding the keyboard remembering this scene. ATTEMPT #4: We needed revenge on this bus. The next day was a late start at school, so Nathan and I devised a plan to get the 16 done in the morning. We got the 7:25 train from South Station, which would arrive at South Attleboro at 8:20. The bus leaves at 8:59. Plenty of time to figure out where it actually boards, so we wouldn’t have to deal with any of the waving ambiguity. Okay, you can see there’s a bit of…er…distortion with the GATRA map, which pretends to be geographically accurate but clearly isn’t. Still, the other two timepoints in the map section shown are pretty easy to find. 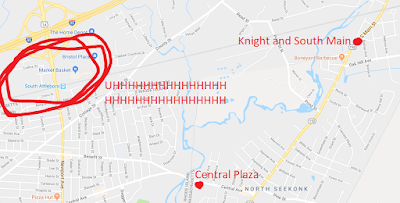 Central Plaza is at the location of the plaza on Central Ave, while “Knight and South Main” is at the intersection with Knight Ave and South Main Street (although actually, Knight Ave intersects with South Main Street twice, and the route map shows the stop at one intersection while GATRA’s GTFS data on Google Maps put the stop at the other intersection, so who knows what the timepoint really is…I used the one on Google Maps). But Market Basket? Who knows??? 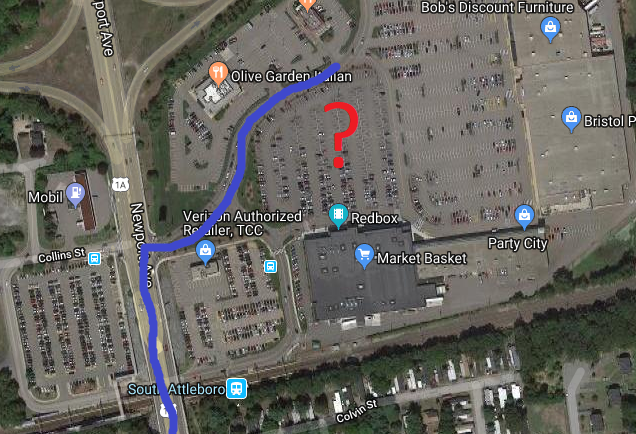 First of all, the GATRA map puts the Market Basket way further into Massachusetts than it actually is, not to mention it inserts some mysterious diagonal ghost road running south of it that doesn’t exist (if it’s supposed to be County Street, then it’s in the complete wrong location). And what the heck does it show the bus doing? Just kinda meandering up? 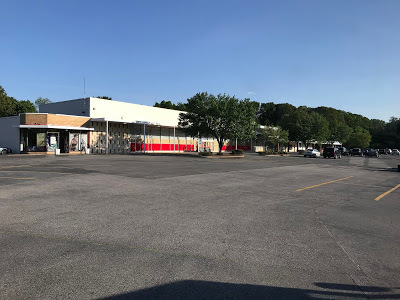 The best thing I can get from that, and what we got at the time, is that it goes into the parking lot (by the way, those bus stops on Google Maps appear to the user as RIPTA stops, so ignore them). 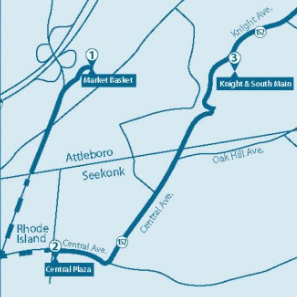 Basically, what we extrapolated from this was: the map makes no sense, but it’s GATRA, so it’s most likely going to directly serve the Market Basket. 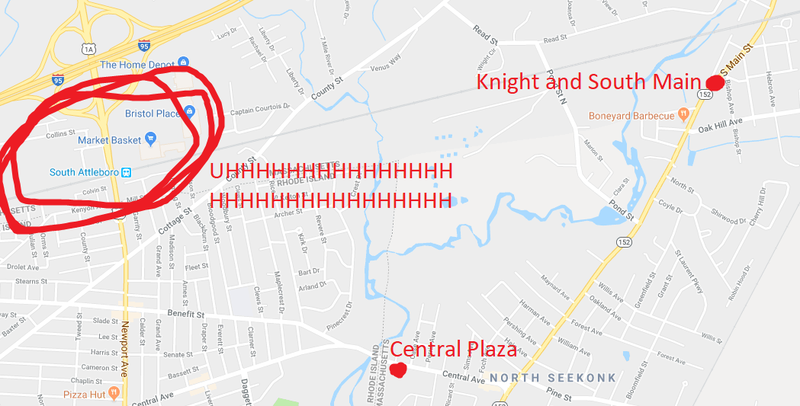 And actually, we didn’t know this at the time, but if you zoom in close enough on the map, there is a GATRA stop shown right outside the Market Basket. So anyone would think it directly goes there. Thus, after buying a few snacks from inside, we perched ourselves outside the store and waited for that 8:59 bus. Finally, at around 9:10 (because of course it was late), we saw the bus come off of Newport Ave and take a right. Awesome. But then…it took another right. It was looping around on the connector road! 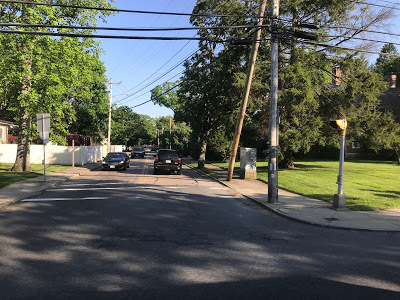 “No no no no no no no,” I said in disbelief as we started running up towards Newport Ave. “We can get it on the other side!” I said as we came up to the road. It was a six-lane highway. There was no way we were getting across that, but I kept looking for openings anyway. There was the bus coming from the other side. I waved my arms off, thinking there was a possibility we could maybe make it across this highway without getting killed. The driver gave a “What am I supposed to do?” hand motion and drove off. I don’t think I’ve ever screamed so loudly in my life. Okay, but granted, it wasn’t the driver’s fault this time. It’s just that, oh, I dunno, WHOEVER MADE THE 16’S ROUTE MAP HAS NO IDEA HOW GEOGRAPHY WORKS!!!!!! I’m fine with a diagram. I’m fine with a geographically-accurate map. But doing a mixture of BOTH is the stupidest thing! You can’t pretend it’s a geographic map when you’re heavily distorting reality! Also, PLEASE JUST USE ACTUAL ROADS! 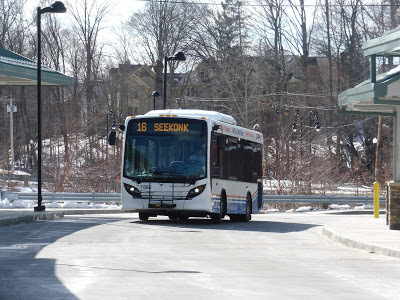 If it had just shown the bus looping around on the connector road, we would’ve known to get it from the RIPTA stop! But NO, we just get a random splotch of route and GATRA expects us to know what that means! AT LEAST PUT THE REAL STOP ON GOOGLE MAPS!!!!!!!!!!!!!!!!!!! ATTEMPT #5: Okay, this was it. We were going to get it this time. Kill this bus route from hell once and for all. The next day, we had another marching rehearsal after school. Luckily, the band had improved sufficiently enough that we could end early. Well, “early” meaning 3:53 or so. Also, there were no doors locked this time, so we could put our stuff away quickly and get out of the school. We were shooting for the 4:30 train. We could get that 68 this time, except…except it wasn’t coming. Why was the tracker only at 5 minutes? Why was the bus just sitting at one spot without moving? We both realized it at the same time: Harvard graduation. Buses were on detour. That was out. Time to run to the Red Line again. That was easier said than done, of course. There were so many slow people, and we were lucky if we could get a hundred feet of open space to actually run. We eventually made it down to the Harvard platform, and it was packed. When the train came in, everyone slowwwwwwwwwwwly moved in, and we were crush loaded by the time we could leave at 4:11. The dwells were worse than usual. We departed Park Street at around 4:25 and started to get into position to leave. “You trying to get a train?” someone asked. “Yeah, the 4:30,” Nathan responded. “Yeah, you’re not gonna make that,” the person said, “I have a 4:40, so I’m good.” Okay, thanks for the encouragement, sir. We came into South Station at 4:28 and some change, but the few people ahead of us were leaving the train so slowly. Finally, we were able to push past them, sprint up the stairs, and enter into the main station. I saw some runners for our train, which was a good sign. We came up close behind them, and just barely made it on board before it left at 4:30 and 30 seconds. We had made it onto the train, but we couldn’t celebrate yet. The devil bus had yet to be conquered. We were getting it from Attleboro this time, arriving on the train slightly late at around 5:19. That was okay, though – the bus was a 5:26 departure. 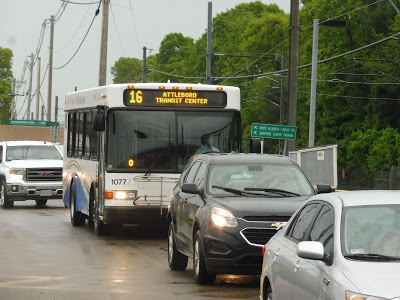 The real problem was that we didn’t have all that much screw-up time on the 16 – the bus was scheduled to arrive at South Attleboro at 5:53, and the train home was a 6:09. 16 minutes of screw-up time, or else it would be a 90-minute wait for the next train. A neat discovery in Attleboro was that GATRA now has a real-time departure board there! It was the ugliest real-time departure board I’ve ever seen, and I wish I had gotten a picture of it now, but it was really nice to have, especially given the circumstances. The board said the bus would be four minutes late, which was okay. But it kept getting later. And later. And later. Finally, at 5:34, the devil bus came into the busway. “I’ve gotta take a quick break,” the driver said to us. “It’ll only be a minute…or two.” Nathan and I looked at each other. We silently agreed that we were going to get on this thing and ride it in its entirety, regardless of how many punches it would try to throw. If we had to wait an hour and a half…so be it. The driver came back, and we stepped into the gates of hell. It had tried to stop us so many times, but we were finally on board the 16. We were going to do this. 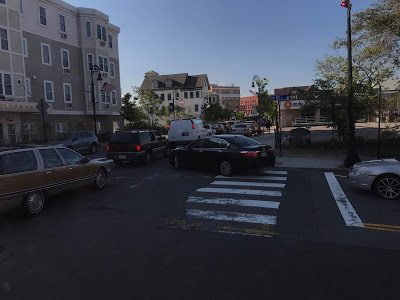 We left the busway, came onto South Main Street, and…ran into a ton of traffic. But wait! The bus makes a right onto Mill Street! We left the jam, going under the Commuter Rail tracks, and then took a left onto Union Street. This was an industrial backlot kind of area, but it did have the fancy GATRA Union Street Shelter, where we dropped one of our passengers off. 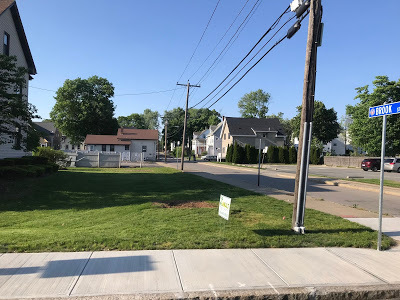 We turned onto Park Street from there, which took on a more residential bent, but the huge Sturdy Hospital appeared when we turned onto O’Neil Boulevard. We dropped another passenger off at the stop across the street from the hospital. Some of the houses in the neighborhood. O’Neil Boulevard soon turned industrial, though, and there were lots of warehouses and offices along there until we turned onto Maple Street. 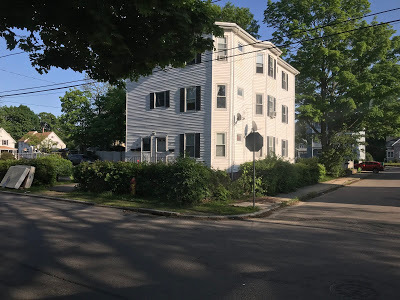 This dense residential road was supposed to be a straight shot to our next timepoint, Attleboro Crossing, but some construction forced us to detour onto Lafayette Street. Looks like we won’t make it from Union Street to Attleboro Crossing in the scheduled four minutes…not that that’s possible under normal circumstances, mind you. 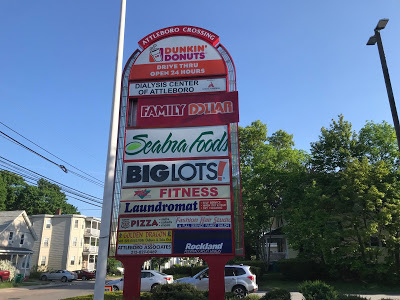 We turned onto Mulberry Street, and we had to cut across South Main Street in order to actually get into Attleboro Crossing, a really boring shopping plaza. I will give this to GATRA: under normal circumstances, it’s actually a really good deviation, since the route jogs through it in both directions rather than properly deviates. There’s even a shelter on the outbound side, and it makes sense that it’s there, since we’ve basically looped back to the transit center at this point – it’s less than a fifteen minute walk away. Not a great menu of stores. Someone got on here, and of course they had to have a conversation with the driver before paying their fare. We were already late! Let’s go! Hurry up! 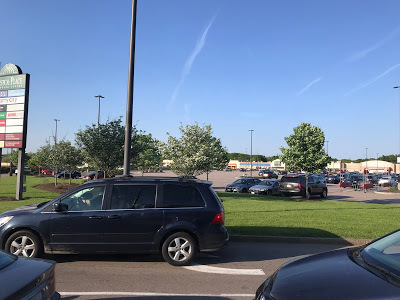 We maneuvered around to leave the mall and turned onto South Main Street, whose houses quickly got less dense and more suburban. We were basically just cruising past leafy houses without stopping, with me checking how we were doing versus the schedule (we were late) and Nathan checking how the train was doing (it was on time). 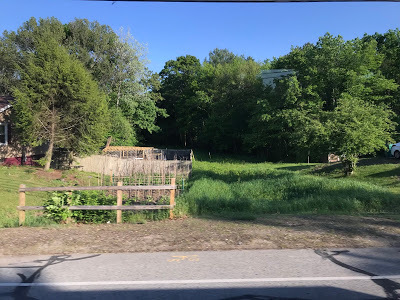 We came into a place called Dodgeville, which had a gas station and a few dense apartments and housing developments, but no one got off here. Going by a big factory, there were a few more apartments before we went over the Northeast Corridor. We went by a field and a cemetery on the other side, but it was mostly just more suburban houses. A little garden, I guess? We suddenly turned onto the tiny Knight Ave, and assuming this was the “Knight and South Main” timepoint, we were now 16 minutes late, which was the exact amount of screw-up time that was allotted. If the other intersection between Knight and South Main was the timepoint, we were even later. We were almost certain we wouldn’t make the train at this point. It didn’t help that when dropping our remaining passengers off at an apartment building called Hebron Village, one of them just had to hold a conversation with the driver. PLEASE stop talking!!!!!!!! Coming back onto South Main Street. We used Webber Street to go back onto South Main Street, which crossed the Northeast Corridor again. 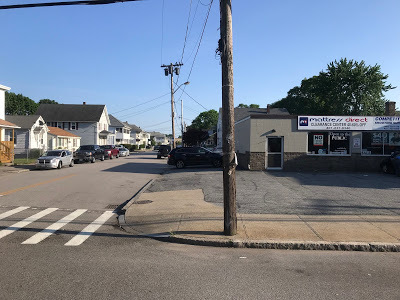 There were some businesses as we entered Seekonk and the road became Central Ave, and actually, there were some little retail spots on occasion between the houses now. However, we hit another traffic jam near a large intersection with a ton of businesses around it, including a Stop & Shop. Central Ave curved westward at this intersection, and we went with it, going through a residential neighborhood. We had to deviate to serve Central Plaza, serving a shelter that was literally about 30 feet from the road. Also, Central Plaza has to have been one of the most ugly, boring, and nothing shopping centers I’ve ever seen, let alone deviated into. That’s about it for Central Plaza. We entered Pawtucket, Rhode Island immediately after Central Plaza. GATRA buses can’t stop while in Rhode Island, a no-stop zone that’s actually marked on the map (tell that to the driver from Attempt #3). It’s ironic, though, since this is probably the densest area in GATRA’s entire system. Aside from an elementary school, it was all dense houses every which way. Oh, and a mattress shop, I guess. Nathan checked the progress of the train again. “It’s running three minutes late!” he exclaimed. Oh my God, we actually had a chance. It was 6:05 when we turned onto Newport Ave, going by retail on both sides, but we were barely paying attention anymore. We had to be ready to get off this thing when we arrived. 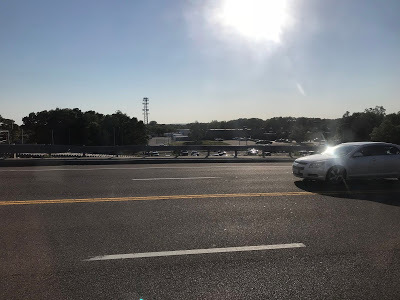 We crossed over the Northeast Corridor into Massachusetts and made the right onto the connector road. We got off at the RIPTA stop and started running down the pedestrian-unfriendly roads. 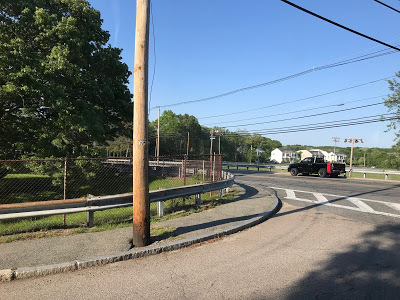 We had to stay on the northern side of the connector road in order to get to the staircase to the station footbridge, so we sprinted along the sidewalk-less connector road in its tunnel, then we bounded up the footbridge stairs two at a time. We crossed over and flew down the ramp to the platform, where there were people, and…here comes the train. The train is pulling up. We are stepping onto the train. We…we…we did it. WE. CONQUERED. THE. 16!!!!!!!!!!! I didn’t have time to get a picture of the bus, so here’s us going onto the connector road. Pros: You know, I never thought that the underworld would benefit from a bus system, but it seems like the 16 actually gets some people. And after all, GATRA is a fitting agency to operate down there. Okay, okay, in all seriousness, the route does connect up some good locations, and on our trip, all of the deviations got people. Cons: HMMMMMMMMMMMM…LET’S JUST RUN THROUGH ALL THE REASONS I COULDN’T RIDE IT! ATTEMPTS #1 AND #2: THE BUS WAS REALLY LATE. YES, THE 16 HAS HORRIBLE ON-TIME PERFORMANCE, AND IT DOESN’T HELP THAT IT’S INTERLINED WITH THE 10, ANOTHER ROUTE WITH AWFUL ON-TIME PERFORMANCE. IT GETS NO TIME DURING THE INTERLINE, TOO, SO IT’S ALMOST GUARANTEED TO BE LATE! GATRA NEEDS TO CHANGE THE TIMING ON ALL OF ITS ATTLEBORO ROUTES, I SWEAR. ATTEMPT #4: THIS. ROUTE’S. MAP. IS. AWFUL. 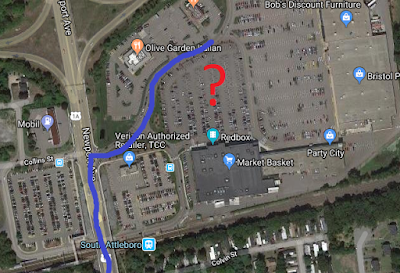 ROADS THAT DON’T EXIST, COMPLETELY DISTORTED GEOGRAPHY, A MADE-UP ROUTE…AND IT DOESN’T HELP THAT ON GOOGLE MAPS, THE STOP IS SHOWN AT MARKET BASKET. THIS IS SO BAFFLINGLY INCOMPETENT! INTERIM ATTEMPTS BETWEEN #1 AND #2: YEAH, REMEMBER HOW I MENTIONED THIS ROUTE DOESN’T TIME WITH ANYTHING? I GUESS THAT’S NOT REALLY ITS FAULT, BUT THIS SCHEDULE MAKES NO SENSE. HERE ARE SOME OF THE WEEKDAY DEPARTURES FROM ATTLEBORO: 8:30, 9:35, 10:28, 11:33, 12:32…YUP, I’M GETTING MWRTA FLASHBACKS! IF THE TIMES ARE GOING TO BE SO FREAKING WEIRD, HOW ABOUT YOU AT LEAST USE REALISTIC RUNNING TIMES SO THE ROUTE ISN’T LATE ALL THE TIME?!?!?!?!?!?!? Nearby and Noteworthy: THIS ROUTE WILL STEAL YOUR SOUL AND YOUR FIRST-BORN CHILD. DON’T USE IT FOR ANYTHING. HA! I’VE DONE IT! I’VE RIDDEN YOU FROM END TO FREAKING END! THERE’S NOTHING ELSE YOU CAN DO, 16! I’VE GOT YOU CORNERED! I DON’T CARE THAT YOU ACTUALLY GET SOME PEOPLE SO I KINDA HAVE TO GIVE YOU A 2! IT’S TIME FOR YOU…TO DIEEEEEEEEEEEEEEEE!!!!!!!!! MWAHAHAHAHAHAHAHAHA GO BACK TO WHERE YOU CAME FROM YOU STUPID HELLSPAWN GATRA BUS!!!!!!!!!!!!! how did this rote get a 2 out of 10 lol, it surly dersveres a 0 , I mean it's the bus from hell!